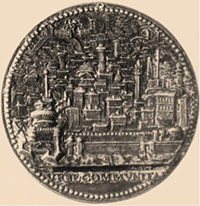 ‘Civitas Pia’ of Pius IV. The legend ‘URBE COMMUNITA’ means “[Celebrating] the completion of the fortification of the city”. Roger Vella Bonavita is an Honorary Senior Research Fellow of The University of Western Australia. He was born in Malta in 1940 and educated at St Edward’s College, Cottonera. He took his Bachelor’s degree with Honours in History and then his Master’s degree (by thesis) at Manchester University. In 1982, after some eighteen years as a lecturer in modern history at the Royal University of Malta, where he specialised in the evolution of Italian fortifications in the sixteenth century, he moved to Perth with his family. A (very) varied career outside academe followed until he retired and returned to his books, taking his Doctorate from the University of Malta in 2011 with a thesis on “A Gentleman of Cortona: the life and achievements of Capitano Francesco Laparelli da Cortona (1521-1570)”. He is a member of the Accademia Etrusca di Cortona. He researches and writes mainly on military and political history of Malta. This lecture will be delivered again later this month at EAUH18, an international conference on “Urban Renewal and Resiliance: cities in comparative perspective” organised by the European Association of Urban History at Roma Tre University.